Invented by the Venetians in the 1500s, cement-based terrazzo is one of the oldest types of decorative flooring systems. This mosaic-like floor topping made by embedding small pieces of marble or granite in mortar, followed by polishing is still highly prized for its timeless beauty. But a newer type of terrazzo has entered the scene, offering a host of benefits that threaten to shrink the market for traditional cement-based systems. This formidable competitor is thin-set epoxy terrazzo a poured-in-place topping for concrete substrates that goes on at a thickness of only 1/4 to 3/8 inch, as opposed to traditional terrazzo that must be applied at thicknesses of 2 to 3 inches. This modern-day terrazzo is excellent for multicolored patterns and designs because the epoxy resin matrix can be pigmented, like paint, to achieve an unlimited spectrum of colors. And it can accommodate a wider variety of richly colored aggregates, including chips of marble or granite, recycled glass, mother of pearl, and various synthetic materials. With the creative use of divider strips to separate areas of contrasting colors, it's possible to produce borders, logos, geometrical designs, and other artistic compositions. 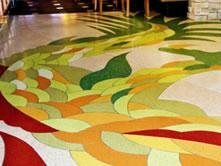 "But the aesthetic value of epoxy terrazzo isn't the only reason these toppings are gaining in popularity, and why they have captured more than 70 percent of today's terrazzo market," according to George Hardy, executive director of the National Terrazzo & Mosaic Association (NTMA). They also offer outstanding durability and wear, making them tough enough for use in high-traffic commercial and industrial environments. Because the binder is 100% epoxy, the finished floor surface provides greater resiliency, chemical resistance, compressive strengths, and flexibility than cement-based systems. 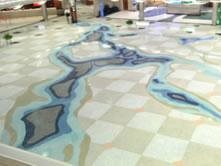 "Epoxy terrazzo is extremely long wearing," says Robert Cain, president of Key Resin Co., Batavia, Ohio. "It's a 40-year life-expectancy floor, and has the lowest life-cycle cost of any hard floor surface." Stop Waxing Terrazzo & Save Impact for Terrazzo is an impressive low maintenance option!